World Wetlands Day is officially launched in France at a national event, held at a different wetland site each year to begin the celebrations. 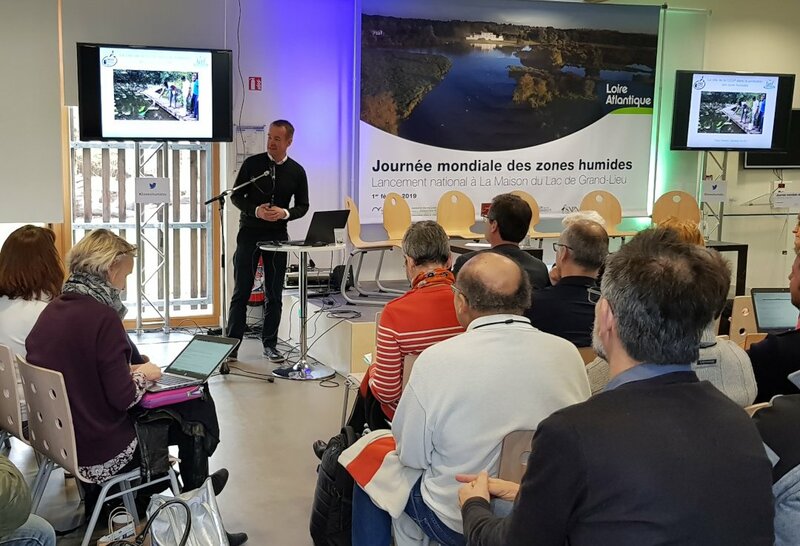 This year the WLI/MBP colleagues at the Lac du Grand Lieu hosted the event, with 125 guests taking part, including Ramsar Association France, the CEPA focal point for France, local politicians and even a pre-recorded message from the Minister for Environment. A climate change expert, Valerie Masson-Delmotte gave an excellent and hard-hitting talk on climate change and the role of education and CEPA in supporting people to take action. The head of WLI, Chris Rostron, was invited and gave a presentation on the role of wetland centres and CEPA in protecting wetlands, highlighting the importance of giving people a positive experience of wetlands and encouraging them to take action. Two round tables were also held to allow discussion on the issues, one concerning climate change and the other on the role of CEPA. France is hosting around 600 World Wetlands Day events nationally, and is very active in using Ramsar to promote wise use of wetlands. Thanks to Olivier, Audrey and the team at the Maison du Lac de Grand Lieu for hosting the event.